What is a person supposed to say about Sympathy Pain’s Long Gone? It seems hard to give a constructive review when I feel so damn good about it. May I gush? May I say a few words quite obviously feigning at unbiased analysis? I may; I must. Long Gone is a rare album, indeed. Within four songs—each with a playing time of over eight minutes—Sympathy Pain manages to capture a sound that is something beyond the simple breakdown of notes and movements, beyond my powers as a critic to articulate, and more rightly belonging to the realm of emotion—pure, unadulterated emotion. It audibly presents the movements of the heart when words like hollowness, loneliness and bittersweet desolation are introduced into every beat. “Heartworm” opens the album to pleasing effect. With what sounds like the striking of stones to start a fire acting as an inarticulate percussion, the song prods forward with brief waves of distortion rising behind a foreground of sumptuous guitar plucking and strumming. The overall sound is something similar to the saddest, most guitar-driven songs from Death Cab’s We Have the Facts and We’re Voting Yes mixed with Andrew Liles’ most ambient numbers from Reached Premature Maturity. The title track is more directly feedback- and distortion-driven, where even the most melodic moments decay into harsh dissonance. “Made of Glass” begins with a synth or guitar—it is often impossible to discern which—creating an unearthly noise that eventually gives way to a type of melodic and metallic grinding. And “Always Leaving” does, in a menagerie of distant rumblings and appreciable ringings, what any final song should do, which is leave us wanting more. It is somehow more hopeful than the opener, and manages to call us to repeat the album endlessly. 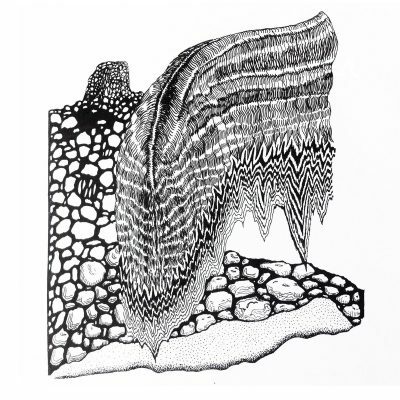 The album artwork, by Dallin Kapp, reflects a certain organic desolation—a picture featuring a rock structure standing under the force of a pounding stream or corroding algae. Yet, depicted in black and white, it is difficult to say which force is causing the destruction here.